Budget hawks at the Texas Legislature should be taking a close look at the state prison system this year. Without significant policy changes to take some of the stress off of the agency and its employees, the system is on the verge of crisis along several axes. 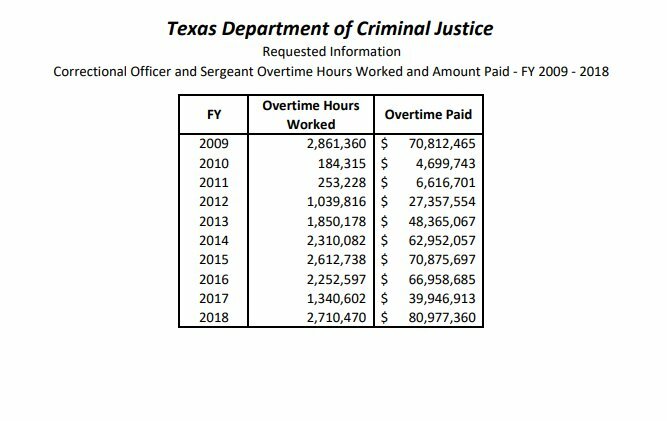 As the Texas Senate Finance Committee prepares to hear testimony today on the Texas Department of Criminal Justice's budget request, the Houston Chronicle's Keri Blakinger reported over the weekend that understaffing at several rural prison units is reaching crisis levels, with system-wide turnover approaching 30 percent. Overtime last year cost $80 million, the most ever spent, and overtime hours were nearly triple 2012 levels. TDCJ is asking the Lege to solve the problems by raising salaries by $156 million. And salaries should be higher. But that wouldn't cause staff to magically appear in Kenedy or Hartley Counties, for example. There just aren't enough people there to entice with dangerous, low paying work. And if you're willing to move, there is dangerous, high paying work to be had in the oil fields. It's not hard to see why folks leave rural prison jobs as soon as they can find something else. Grits has been harping on understaffing at rural units for years, and consider those prime candidates for closure. It's pretty easy to envision sentencing reduction packages for low-level drug offenses and probation reforms to reduce revocations that would let the Lege close several of these far-flung, understaffed units. I'm hoping we see some of those filed this session. These days, lots of people want to reduce mass incarceration simply because it's the right thing to do, and your correspondent counts himself on that list. But even for policymakers who lack that predilection, there are strong arguments for reducing the size of Texas' prison system based in pragmatism and fiscal conservatism. Prison healthcare costs are skyrocketing: TDCJ says it needs $247 million to continue providing current levels of services. The draft Senate budget reduces prison healthcare by $1.3 million, while the House budget only gave them $160 million of what they need. Reduce the number of prisoners, reduce medical expenses. Maintenance costs rising: TDCJ has asked for $146 million in new maintenance spending this biennium. They're going to ask for another nine-figure maintenance bump next biennium, as well. Some units should be closed instead of repaired. Penalty reductions could free up money for treatment: Presently, treatment dollars are scarce and waiting lists for substance-abuse treatment are long. Reducing user-level drug possession to a Class A misdemeanor would free up nearly $200 million per biennium. A budget rider could designate that all savings certified from the change be spent on drug treatment. Crime has been declining for a long time now, but Texas prisons remain full. That can change - we can reduce incarceration without reducing public safety - but it will require viewing the question through a policy lens, not just a budgetary one. Throwing more money at prisons without addressing policies that keep the prisons full will just kick the can down the road. Eventually, the Legislature must reduce incarceration. It would be better if they did so before understaffing flowers into a full-blown public safety crisis at remote, rural units that gets people killed. Prisons as rural economic drivers has played itself out, per an old joke about a town too small to have a Texas prison, a Dairy Queen or an AA meeting. It will hurt those towns to lose these prisons. But, not THAT much, if they're that understaffed. I used to live in Marlin; 40-year-old main unit constantly being Band-Aided by the state in a town which has been in the news more than once for water problems. Close it. Exactly! Pulling that band-aid off won't hurt that much when they can't find staff to work there, anyway. My kinfolk on both sides of the family are from Dalhart. The unit there has barely been able to stay above 50% staffed ever since a big, better-paying cheese factory opened up there. Most folks there wouldn't miss it. Agreed Grits! Geography, like the ability to hire correctional staff, are everything! I understand Bartlett was targeted for closure because it was a contract unit. However, they didn't have nearly the staffing issues that they have at Marlin! And now they have to use resources to take care of the empty prison at Bartlett? That's just crazy! Note to State Legislature: Sell it!